The Internet is under threat in India as telecom operators have gone to the Telecom Regulatory Authority of India (TRAI) to allow them to block apps and websites and charge money from both consumers and businesses to the detriment of users. 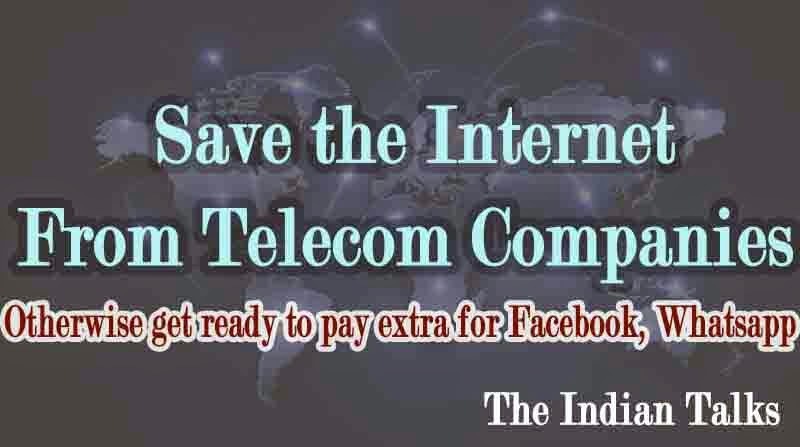 People from a cross section of society including politicians, who are not known for taking any kind of criticism lightly, and celebrities are rallying up to save the Indian Internet. Supporting the campaign to save net neutrality, thousands of Indians have voiced their support and the number is growing by the minute. Indians have sent over 1 lakh emails to TRAI over the issue through the website savetheinternet.in. The emails have been sent in response to the regulator's call for public consultation. The scheduled government deadline for sending in feedback will lapse in a week. The idea of net neutrality or free and equal Internet to all has garnered wide attention from across the globe. While countries like the US, Chile, Netherlands and Brazil have already adopted Net Neutrality that doesn't allow discrimination of Internet content or charge users differently based on the content, site, or platform they consume, back home TRAI has also asked for mass feedback to help formulate regulations for consuming the Internet. Though consumers appear to be majorly in favour of net neutrality, telecom companies are up in arms against the concept owing to the notion that bringing equality of Internet would cut down on their prospective revenue from the OTT services that are offered through their network, including apps such as WhatsApp, Flipkart, Skype, etc. Net neutrality means when a service provider sells you data they don't get to choose how the data is used. The idea is that the Internet Service Provider, from whom you buy your internet pack, should not under any circumstance be able to control how exactly you use it. It is up to the consumer, how they wish to spend the data that they have bought from the Internet Service Provider. 2006: TRAI had invited opinion regarding the regulation of net neutrality from various telecom operators. February 2012: Airtel chief, Sunil Bharti Mittal, suggested that services like YouTube should pay an interconnect charge to network operators. In July same year, the company reiterated that large Internet companies like Google and Facebook should share their revenue with telecom companies for allowing their services for free to the users. February 2014: Airtel again raised the proposal of regulating apps like WhatsApp, Skype, and Line. However, TRAI rejected the proposal. March 27, 2015: TRAI, published a 'Consultation Paper on Regulatory Framework for Over-the-top (OTT) services' consultation paper, which is a 117-page document describing what net neutrality in India would mean and how it'll impact the way we consume the Internet today. The deadline for comments is April 24. April 6, 2015: Airtel launched its open marketing platform, Airtel Zero, aimed at offering free access only to certain apps. The platform received flak for splitting the Internet into paid and free where Internet companies pay money to Airtel to allow users to get free Internet. While Airtel has widely defended its platform for being akin to the working of a toll-free number, where the caller doesn't pay but the company which uses the marketing tool does. April 11, 2015: Comedy group AIB on YouTube, released a video decoding Net Neutrality and urging Indian netizens to support the cause and spread the word. The video was an instant hit and was shared by the general public as well as big celebrities. But on April 12,the YouTube links of the same video started getting deleted off by Facebook.